A CAMPAIGN group opposing large scale house building in Thornbury has urged people to speak out over the latest plan for a new housing estate. As reported in Thornbury Voice last month, Bovis Homes is seeking permission to build up to 370 houses off Gloucester Road on the north side of the town - the latest in a series of controversial developments. In outline form only, the application involves building across nearly 60 acres (24 hectares) of agricultural land stretching from Upper Morton to Crossways Lane at The Knapp, taking development further out of the town into the countryside towards Whitfield alongside the B4061. Thornbury Residents Against Poorly Planned Development - TRAPP’D - said it needed help from as many people as possible to make comments on the scheme. The group said although the final date for standard consultation comments had already passed, it understood that people’s submissions should still be accepted by South Gloucestershire Council. Agricultural buildings would be knocked down and two primary access roads created off Gloucester Road. 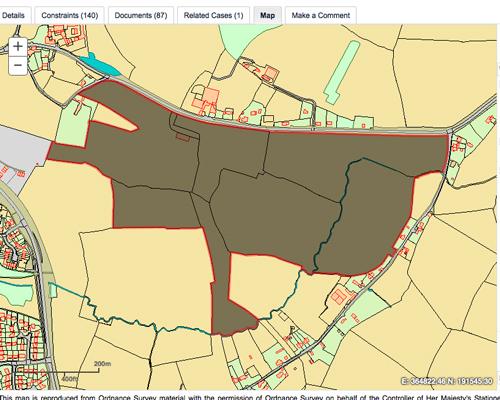 But Roger Hall, of TRAPP’D, said another 370 homes would “stretch the local amenities beyond breaking point”. In a comment to the council from the group, he said: “The building presently taking place in the area is unsustainable and if this application is approved it would saturate this beautiful rural area and also have a significant negative impact on the wildlife. Mr Hall said TRAPP'D had concerns about extra traffic that would be generated by the development, the inability of roads to cope with such an increase, flood risks and the pressure so many new homes were putting on the town’s GP surgeries, schools and sewerage systems. He said residents of Upper Morton had not been formally told about the application, even though it would directly affect them, and claimed the development would cause “substantial harm” and destroy the setting of Upper Morton. Leslie Forrest, of the Campaign to Protect Rural England, said the organisation objected to the plan because the site was not identified in South Gloucestershire's local plan core strategy which, having undergone due process, was adopted as recently as December 2013. He said granting approval would be contrary to that document’s vision for Thornbury.